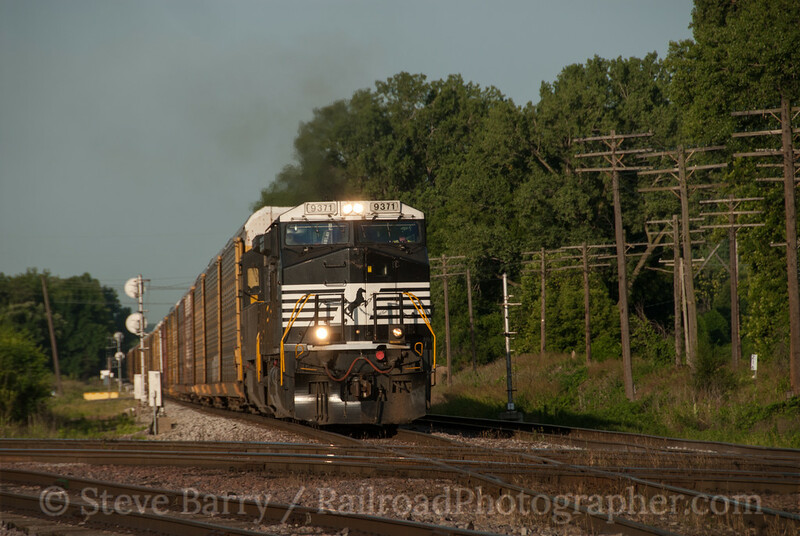 This is Part 2 of a four-part entry on a trip to the Midwest to visit Kansas City and St. Louis before heading on to the convention of the National Railway Historical Society in Cedar Rapids, Iowa. In Part 1 we headed west towards Kansas City. 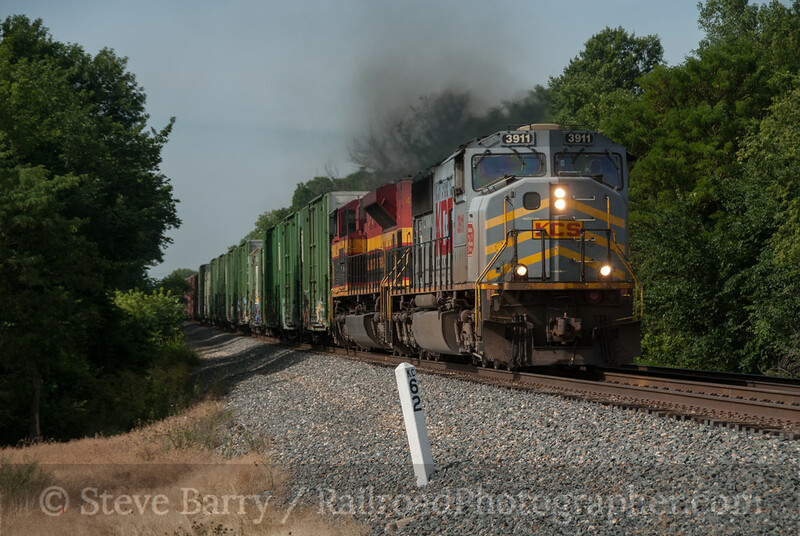 In this installment we railfan around the crossroads of railroading. On the morning of June 12, 2012, I was in Kansas City along with my brother Bruce and friend Frank Ferguson. We were soon picked up by Kansas City resident Kevin EuDaly (owner of White River Productions, a publisher of railroad magazines and books) who took us on a whirlwind tour of the surprisingly compact city -- from the north end to the south Kansas City packs a lot into about six miles of traveling. 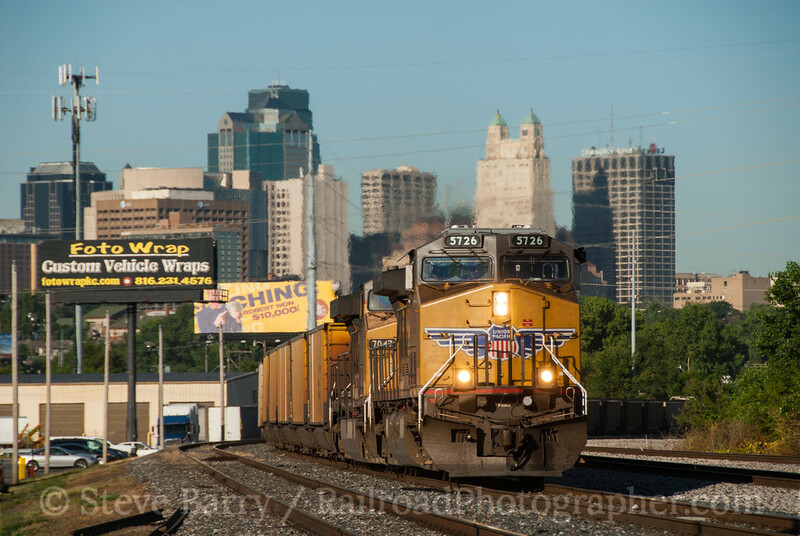 It didn't take long to find locomotives moving around Knoche Yard on the Kansas City Southern, but the first highlight came when we caught a Union Pacific coal train with the city skyline overhead (above). It was then on to Santa Fe Junction, an incredible three-level crossing of trackage where we soon saw Kansas City Terminal at ground level, Union Pacific on the middle level and BNSF Railway soaring overhead, all straddling the Missouri-Kansas border. Around the corner from Santa Fe Junction near 29th Street we spotted an abandoned brewery that we thought would make a nice backdrop for a photo, and it wasn't long before we were rewarded with a BNSF train with plenty of power on the head end. We then went off in search of a Union Pacific ballast train, then caught a BNSF train at Holliday, Kan. From there it was back into the city to Union Station, where we watched trains from the Freight House Bridge (catching BNSF, UP and Amtrak) and enjoying some Kansas City barbecue in the freight house. 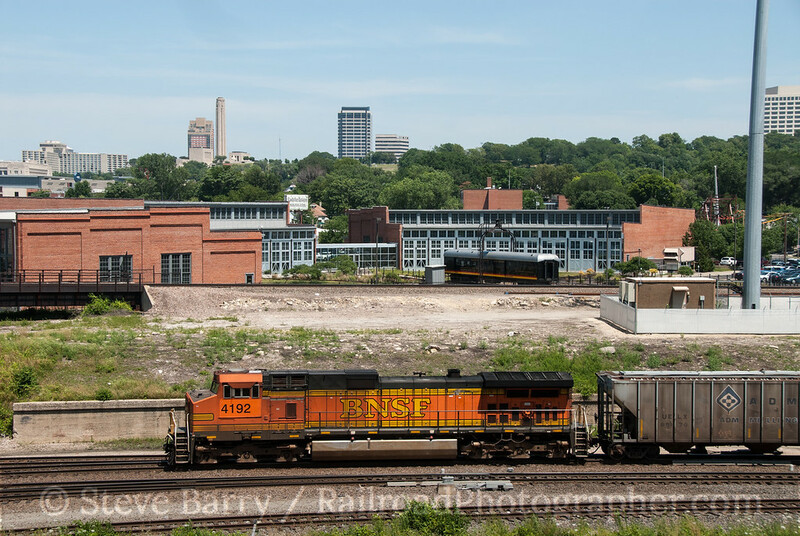 After lunch we headed to the West Bottoms, one of the most photogenic urban railroad locations in the country. 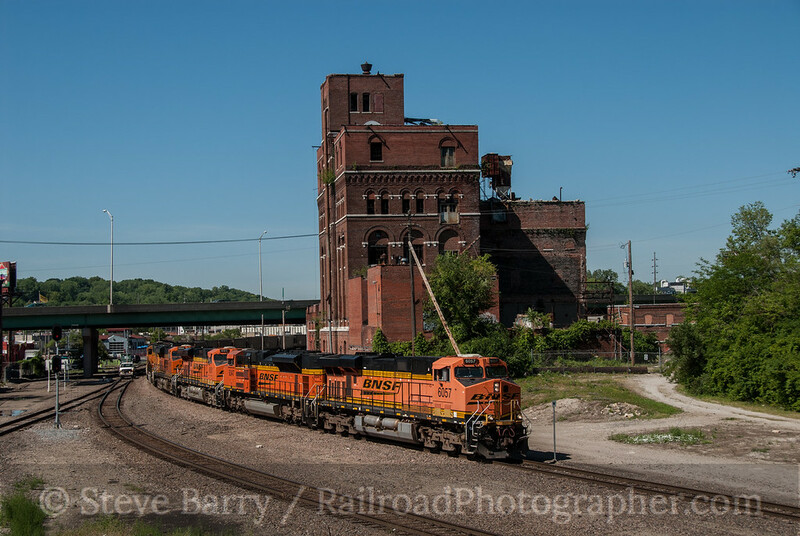 We shot the tower at Old Union Station and then caught a Union Pacific train amidst all the neat brick warehouses of the Bottoms. 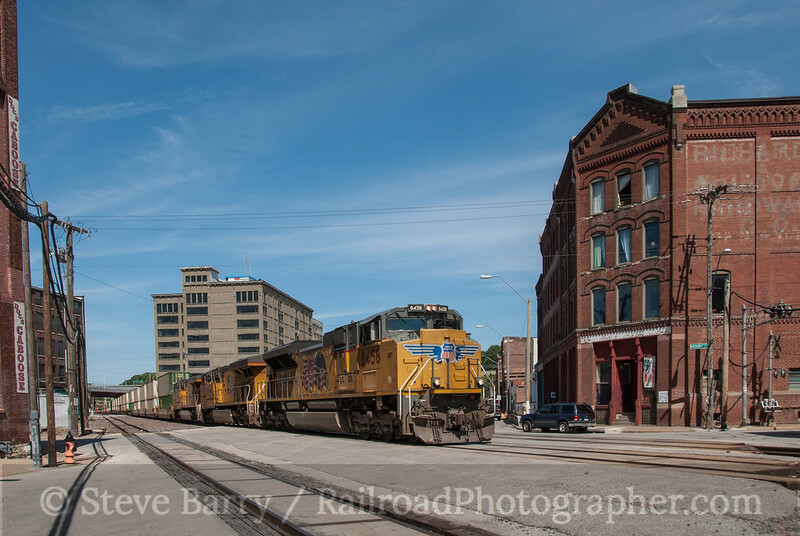 We spent some more time in the West Bottoms, catching the Kansas City Terminal's yellow "bananas" pulling a train near Old Union Station Tower and then watching a BNSF switcher set work the small 19th Street Yard. 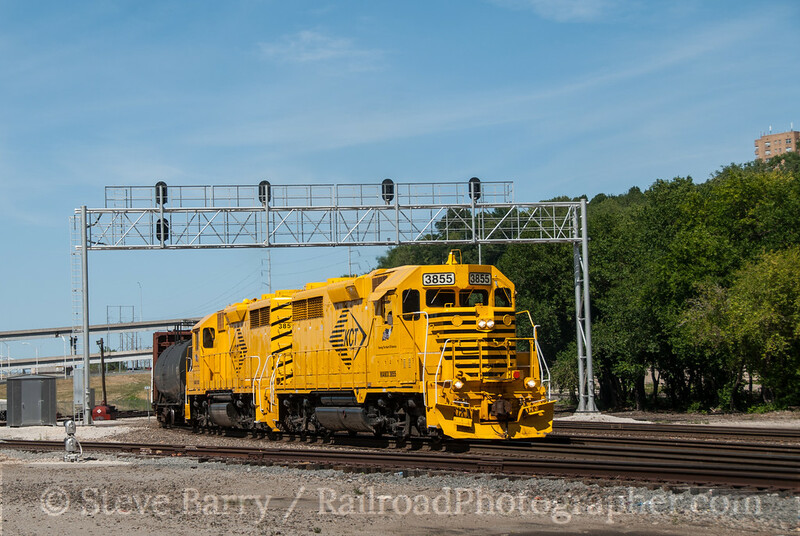 The "bananas" are a pair of former Southern Pacific GP38-2s now working for KCT in a bright yellow paint scheme. Colorful, indeed! 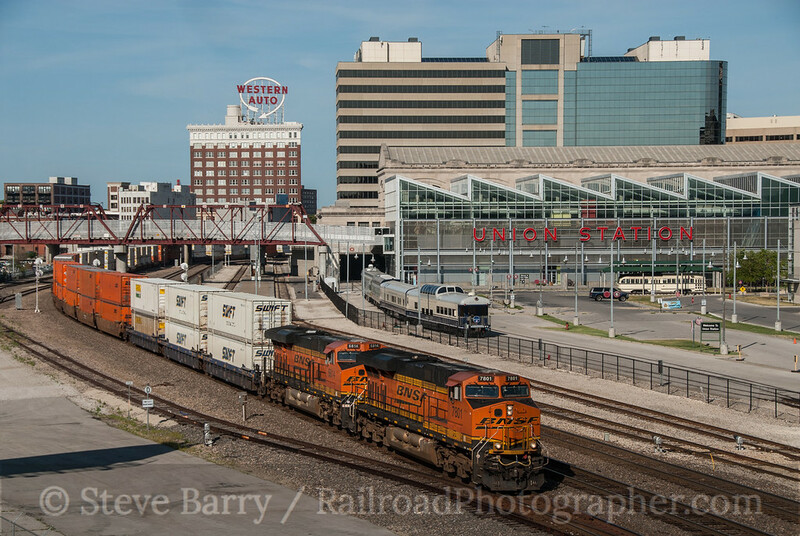 We returned to downtown for the sweet late light at Union Station, where the parade of BNSF and Union Pacific continued, along with Kansas City Southern. We spent our time on the Pennway Street bridge, which gives a great overview of the Union Station complex and the iconic Western Auto building. We finished off our first day in Kansas City with a chase of a BNSF coal train to Lenexa, Kan.
Day two in Kansas City found us at the diamond east of town at Birmingham, Mo., where we shot an eastbound Norfolk Southern auto rack train before returning closer to town to shoot Amtrak at Sugar Creek and Rock Creek. 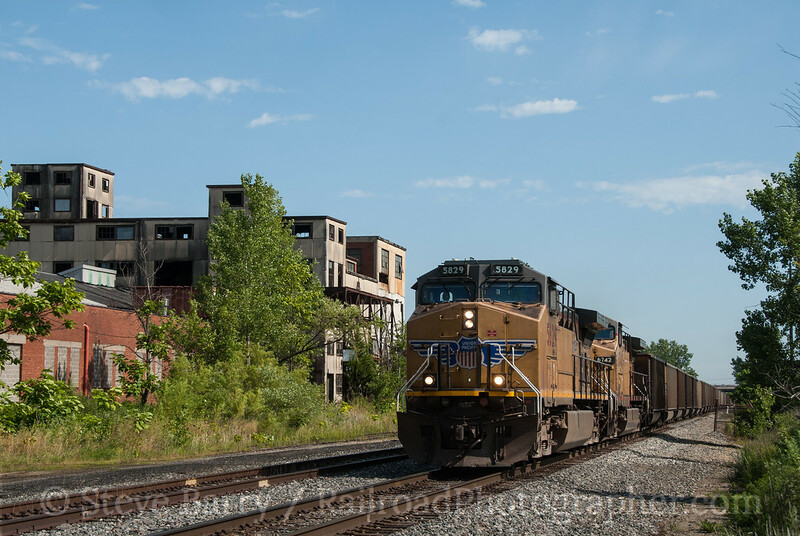 Heading back into town, we blitzed Neff Yard on the Union Pacific, then proceeded to overtake a westbound coal train. Kevin knew just the spot we needed to get to for a good photo of the train, and we were soon trackside with a funky abandoned industrial scene for a backdrop near the border of Kansas City and Independence. We found ourselves back at the skyline shot we had snapped the first thing the previous morning where another UP train (with a very slow conductor throwing switches) was sitting, then headed deeper into town. 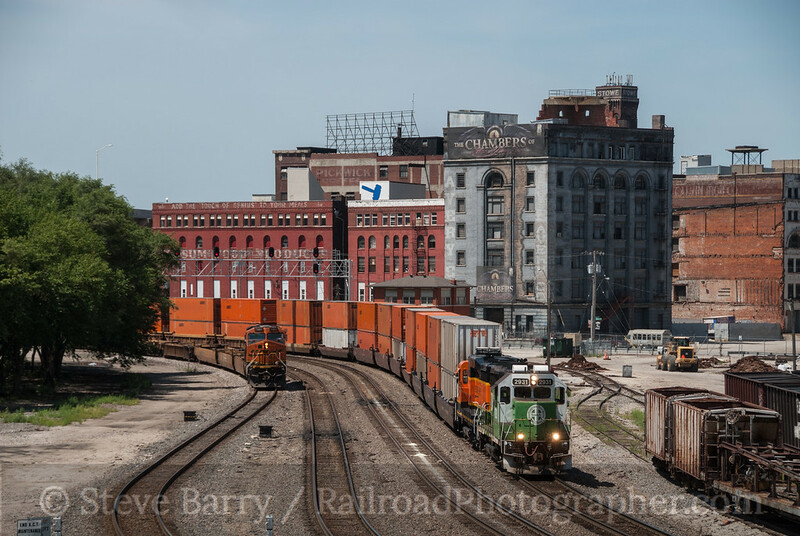 As we passed the West Bottoms, Kevin remembered that I had commented that I had wanted to shoot a scene with Old Union Station Tower and a warehouse converted into a haunted house in the background. We soon pulled into a side road where we encountered a minivan full of British railfans also waiting for a train. Pleasant conversation ensued, and soon a BNSF transfer of Schneider containers, complete with a locomotive in Burlington Northern cascade green and wearing the original Burlington Northern & Santa Fe herald on the nose, made an appearance. I had somehow thought that Lawrence, Kansas, was somewhere in the middle of the state, but I had noticed the previous day that it was only 30 miles or so outside Kansas City. 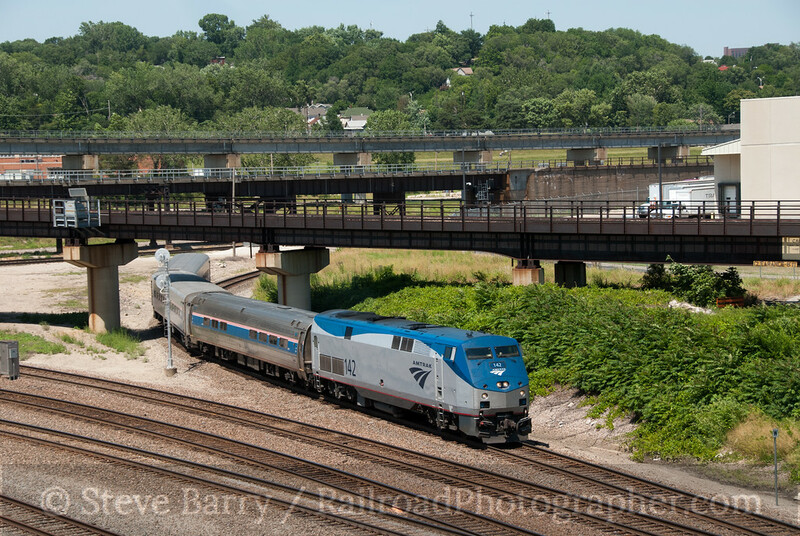 I had always wanted to shoot a train at Don Ball Curve in Lawrence, and since we had already done so well in Kansas City, we decided to head west. After a brief stop at Holliday, Kansas, we found ourselves at the Lawrence train station, now a visitors' center. The late Don Ball, Jr., one of my favorite railroad writers and photographers, had grown up in Lawrence and taken many photos at the curve just east of the station; the curve now informally bears his name. 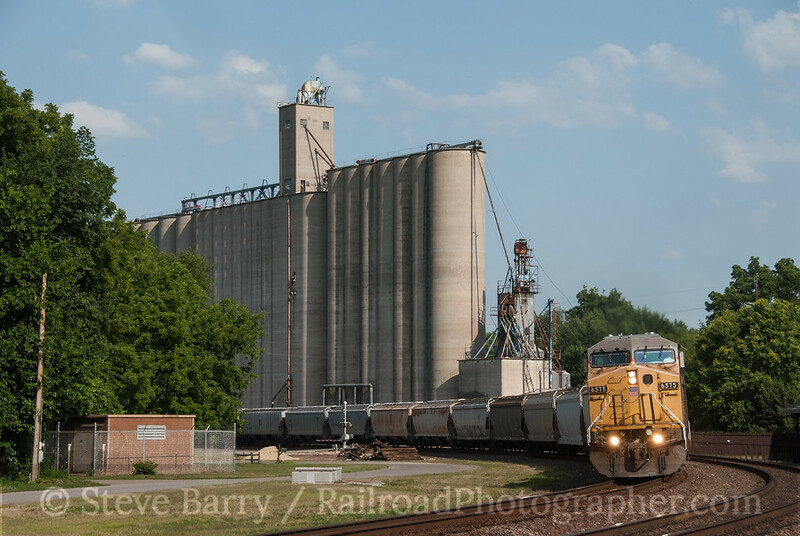 The UP cooperated by sending many trains past the towering grain silos along the curve, and since the sun was only getting better as the afternoon progressed, we spent the rest of the day in Lawrence. That evening we were joined by the Brits we had met earlier at Jim EuDaly's (Kevin's father) house in Kansas City where we spent the evening running trains on his incredible O-Scale Chesapeake & Ohio layout. The one railroad we hadn't gotten our fill of during the trip was Kansas City Southern, so day three in K.C. found us heading south along the KCS main line in search of trains. We finally stopped at Amsterdam, and soon we had a northbound to chase back towards the city. After a spirited chase north, the train met a southbound at Grandview so we chased back south a short distance. At this point Kevin had to get back to work at White River Productions so we bid farewell. Bruce, Frank and I proceeded into downtown Kansas City to get an overview shot of Union Station from the park across the street, then headed back to 29th Street where a dead-end bridge gave us a nice overview of the bridges at Santa Fe Junction as well as State Line Junction. The location is directly adjacent to the former Kansas City Terminal roundhouse, which has been nicely restored as office space, and we were able to work that into our shots. Just as we were ready to leave, we heard the switches throw beneath our vantage point. Knowing that when switches throw there is usually a train movement shortly thereafter, we stuck around and saw an Amtrak train pass through State Line Junction and come beneath us. Westbound Amtrak trains terminate just east of our location at Union Station, but the trains need to be turned on the wye at State Line between runs so they can head back east, so the deadheading Amtrak train passed beneath us, then reversed direction to head up the west leg of the wye to Santa Fe Junction. Now it was time to leave Kansas City and start working our way east. The city had been great to us, and a lot of great photos were taken. Lawrence would prove to be the western-most point of the trip, and everything from here on out would be "heading home" (sort of). In the next installment, we shoot in the mountains of northern Missouri, visit St. Louis and wind up in Chicagoland.